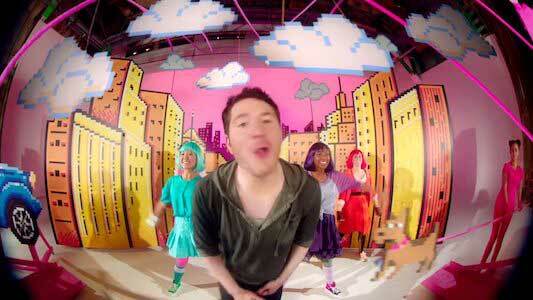 Owl City is an American electronica project that features singer, songwriter and multi-instrumentalist Adam Young. Owl City is perhaps most well known for the 2009 hit “Fireflies”, which itself has become a internet meme since its release. The song “When Can I See You Again” was released as the official theme song for the 2012 Disney animated film Wreck-It Ralph. However, the track has also been used for Disneyland’s crowd favorite Paint The Night Parade, a spiritual successor to the classic Disneyland Main Street Electrical Light Parade. Adam Young performs the song in front of some “Fix-It Felix” machines. The song is an up tempo, dance track that is the ideal kind of song to get kids to get up and dance. Young’s light and poppy vocals fit well with the thumping drums and twinkling synths that make up the music. The lyrics are about how fun of a time Young has had, and all he can wonder is when they can hang out again. This theme is very appropriate for such a fun film like Wreck-It Ralph, as there were many kids who were wondering the same thing after seeing this film. That question has now been answered, since Wreck-It Ralph 2 is scheduled for release in November, 2018. The backup dancers in this video wear brightly colored chucks that match their respective color palettes. The music video features Adam Young in a bright arcade that has the “Fix-It Felix” game from the film. He puts a quarter in the machine, and the music kicks in with some footage from the movie. The rest of the music video cuts in and out with this film footage as Young dances and sings amongst a set of homemade, video game elements. This makes the music video extra appealing to kids as the sets look like they were made by them. The backup dancers are all dressed like characters from the “Sugar Rush” game from the film, with all of them wearing some sort of brightly colored chucks. This actually works very well with the film, as characters like Taffyta Muttonfudge wear an animated form of chucks with their racing gear. 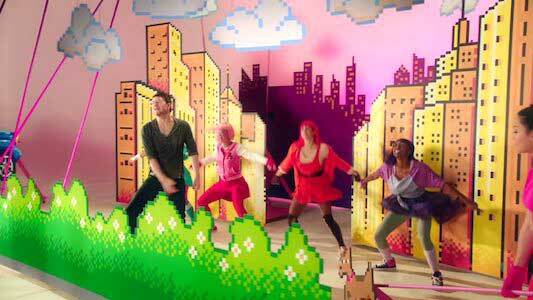 The music video is full of fun video game references, and its bright colors and sets make it a perfect match for the bright and upbeat song it is paired with. The homemade video game sets make this video bright and kid friendly. Use the links below to get yourself a brightly colored pair of chucks to dance in.